• Grab Fast Available for All Users. In Profile section you can see refer and earn option click on it share it with your friends. In the Refer and Earn Section you can see an option Rewards click on it. If you have enough points you can redeem in this area. Refer 5 off your friends and get 100 coins. 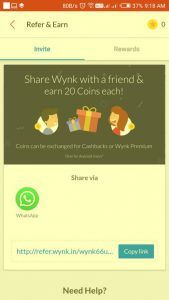 The “Wynk Refer and Earn Program” hereinafter referred to as “Referral program” is a program launched for Wynk Music Android app users wherein they can share their unique link with their friends to install Wynk and earn Coins for every new friend that installs and registers on Wynk Music Android. Users can then redeem their earned Coins for exciting rewards. 5 “Coin” is a created currency unit for the Wynk Refer and Earn program that can have a value ranging from Rs. 0.5 per Coin to Rs. 2 per Coin. “Coin” applicability and usage is limited only to the Wynk Refer and Earn program on Wynk Music Android app. 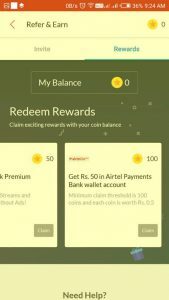 5 Exception: As a one time activity during the launch of Wynk Refer and Earn program, old users of Wynk Music Android app who install and register on the app during the program period but have not been active during the past 100 days will also be eligible for the rewards. However, this exception will apply only once for users falling in this category for the duration of the program.